Gum recession can be successfully treated with safe, effective dental techniques and technology! Call Dr. Chris Stevens today to arrange for your private gum surgery consultation. Gum recession, also called gingival recession, is often the result of gum disease or other problems that cause loss of gum tissue and tooth root exposure. Gum surgery is the only way to make receding gums healthier and more attractive. Patients who come to us with concerns about gum recession frequently have gum disease, a bacterial infection that destroys gum tissue and places the health of the teeth and supporting bone at serious risk. Patients who have gum disease must have it treated before gum surgery. Twice daily brushing, flossing, and maintaining regular dental checkups are important to preventing gum disease and recession. Using a toothbrush with soft bristles or an electric toothbrush can also help to prevent recession. Patients with a misaligned bite have a greater chance of developing gum recession from the excessive pressure it can place on the teeth and gums. Traditional gum disease surgery can also cause the gums to recede, but this condition is now treatable with a variety of gum surgery options. Depending on your situation, Dr. Stevens may suggest a conventional gum grafting procedure, a process that involves taking soft tissue from areas inside of your own mouth, or from a tissue bank, and transferring it to the recession areas. The Pinhole Surgical Technique (PST™) is another option. 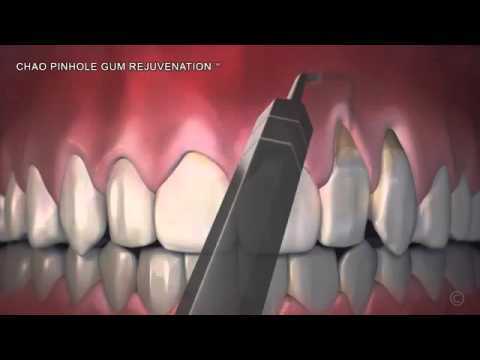 PST™ is a minimally invasive procedure that entails making a very small hole on the gum line, loosening the tissue enough to pull it over the tooth roots and elongate the gum line.